After a brief pause during inauguration week, stocks continued to climb last week. The S&P 500 added 1.03%, the NASDAQ was up 1.90%, and the MSCI EAFE increased by 1.29%. The Dow also grew, adding 1.34%, ending the week above while hitting 20,000 for the first time ever. Consumer confidence matched this positive performance, as the University of Michigan Consumer Sentiment measurement beat expectations in January and reached the highest levels since 2004. However, one piece of data we received last week gave a less rosy view of the economy: initial gross domestic product (GDP) reports. On Friday, we received the first report on real GDP for the fourth quarter of 2016. Growth declined significantly to come in at 1.9%—down from the third quarter’s reading of 3.5%. Many aspects of our economy showed solid growth in the fourth quarter. Household purchases grew, business-equipment spending advanced for the first time in over a year, and inventory accumulation increased. Net exports, however, pulled growth down by 1.7%—the biggest drag since 2010—as we saw a jump in imports coupled with a decline in exports. Working to increase U.S. exports is important because it can help strengthen America’s economy, support additional jobs, and promote sustainable growth. Without net exports pulling down economic expansion, fourth-quarter GDP could have been even higher than in the third quarter. Trade is integral to our economy, and changes in the balance between imports and exports measurably effect growth. The new administration’s potential plans to tax Mexican imports, change trade relationships with China, and restrict visitors from certain countries could affect our imports and exports—and thus our economy. Between lagging GDP and the Dow reaching historic levels, this week showed us a range of perspectives on where the economy now stands. 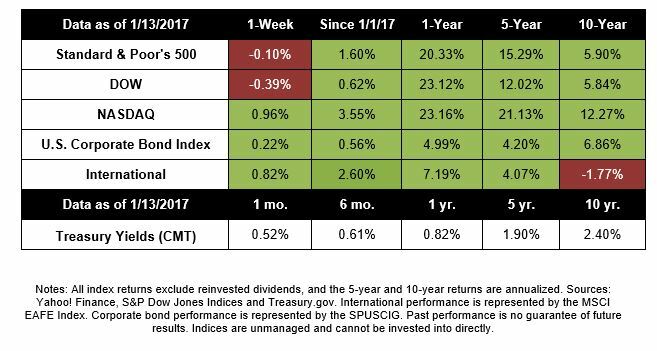 The markets will always have uncertainty and unanswered questions, and—as always—we must stay focused on the fundamentals that drive performance in the long term. For now, we will continue monitoring policy developments and the trade deficit to determine how they may impact economic growth in 2017 and beyond. We will also pay close attention to the economic data upon which we build our strategies for pursuing your goals. As we look back on markets last week, we see mixed results with none of the major domestic indexes gaining or losing more than 1%. The S&P 500 was down 0.10% for the week, and the Dow gave back 0.39%, yet again failing to reach 20,000. On the other hand, the NASDAQ increased by 0.96% and reached its sixth record close in 2017 on Friday—pushed by a 1.36% rally for Facebook after Raymond James upgraded its stock. International stocks in the MSCI EAFE added 0.82%. Retail sales grew. The December monthly retail sales report showed a 0.6% increase, slightly below the 0.7% consensus expectations. With this growth, retail sales are now up 4.1% in the past year. However, not all retailers are performing well. General merchandise stores are suffering as consumers continue to shop online and move away from in-person retail stores. We see the results of this trend in declining retails sales numbers and large companies announcing store closures, including Macy’s, Sears, CVS, and many more. Consumer sentiment was high but divided. The University of Michigan’s monthly report on consumer sentiment was 98.1, just below predictions but still near highs we have not seen since 2004. One interesting finding in the report is a strong partisan divide in consumer confidence. Richard Curtin, director of the consumer survey, described “extreme differences” between people’s expectations for whether new political policies would help or hurt the economy. He reminded people that the most impact on consumer sentiment will come from “actual changes in the economy” as a result of Trump’s work, which we will have to wait a few months to see. Earnings season continues. The markets will be watching earnings closely during this four-day trading week—specifically to see if other major financial institutions also beat expectations. Some analysts believe that to keep the current market rally going and demonstrate that there is weight behind the post-election growth, we’ll need to see excellent reports from most companies. Donald Trump becomes President. While earnings reports will be important to track, another event looms larger in many people’s minds: Donald Trump’s inauguration. After he takes the oath of office Friday morning and becomes President of the United States, we will begin to see how the market’s expectations for Trump’s policies match reality. 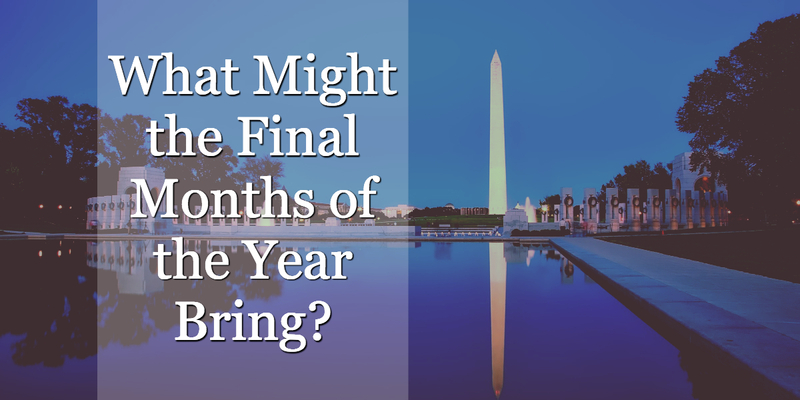 From trade to taxes to infrastructure and beyond, the next few months will give us a number of insights into how U.S. policies may change. Uncertainty remains, and we will watch for political developments that may affect the markets. In addition, we will continue to focus on the fundamentals that provide deep insight into how the economy is performing—and how we can strive to keep you on track toward your goals. Happy New Year! We hope that you had a wonderful holiday season, and feel ready to take on the new year. In this month’s video, we’ll discuss some of the major headlines that influenced markets in December — and provide insight in to what these developments could mean for you as an investor. If you have any questions or concerns after watching this video, send us an email, or give us a call at 419-425-2400. We would love to talk with you. The presidential debate, surging oil prices, and concerns about a global bank all took their toll on the market last week; however, we were pleased to see a positive quarter end for stocks. For the week, the S&P 500 gained 0.17%, the Dow grew 0.26%, the NASDAQ edged up 0.12%, but the MSCI EAFE lost 0.87%. Last week, concerns about one of the world’s largest banks caused investors to worry that a new “Lehman moment” might spark a new financial crisis. Germany’s scandal-prone banking giant is facing financial penalties in the U.S. for the role it played in the financial crisis; the bank’s problems are causing key clients to distance themselves and analysts wonder about the firm’s financial health. Investors reacted to Deutsche Bank’s woes negatively, setting off a 200-point drop in the Dow Jones Industrial Average on Thursday. 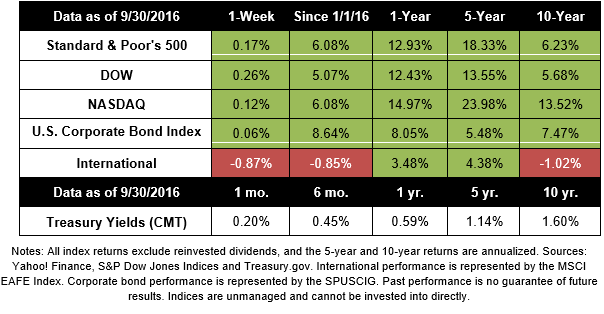 As we enter the final three months of 2016, markets are contending with some headwinds we’re watching. We can expect plenty of headlines around the presidential election as we get closer to November. Political beliefs aside, elections represent a lot of uncertainty, especially with wild-card candidates. Markets may react with relief after election uncertainty resolves; however, concerns about the changes a new administration will bring may also trigger further volatility. Britain’s prime minister announced her intention to begin negotiating the UK’s Brexit from the European Union next spring. By 2019, Britain could be a sovereign nation once again, bringing a slew of changes to the EU. Ultimately, we don’t expect to see too much volatility around the Brexit until next year. Oil prices might have finally hit bottom and be poised to rally this fall. Major oil producers, including Saudi Arabia and Iran, seem ready to coordinate production to bring oil prices back up. If a pact is made (and held), oil could head back toward $60/barrel next year, which would bring relief to beleaguered U.S. energy companies. However, higher oil process could bite consumers by making gas more expensive at the pump. It’s likely that oil prices will play a role in market movements in the weeks to come. The week ahead is packed with data, including the September jobs report, which may factor into future Federal Reserve interest rate decisions. As always, we’ll keep you updated. New home sales tumble in August. Sales of newly constructed homes fell 7.6% in August after surging in July to the highest level in nearly nine years. The retreat isn’t unexpected and further volatility in the housing sector may occur. Pending home sales drop. The number of homes under contract slumped in August, suggesting that home sales fell across the board. Since pending sales forecast future activity, it’s likely the drop in housing activity will be felt in the weeks ahead.